Chemistry affords two general methods of determining the constituent principles of bodies, the method of analysis, and that of synthesis. When, for instance, by combining water with alkohol, we form the species of liquor called, in commercial language, brandy or spirit of wine, we certainly have a right to conclude, that brandy, or spirit of wine, is composed of alkohol combined with water. We can produce the same result by the analytical method; and in general it ought to be considered as a principle in chemical science, never to rest satisfied without both these species of proofs. We have this advantage in the analysis of atmospherical air, being able both to decompound it, and to form it a new in the most satisfactory manner. Elements of Chemistry (1790), trans. R. Kerr, 33. Food may be defined as material which, when taken into the body, serves to either form tissue or yield energy, or both. 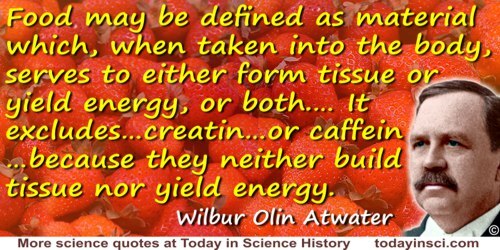 This definition includes all the ordinary food materials, since they both build tissue and yield energy. It includes sugar and starch, because they yield energy and form fatty tissue. 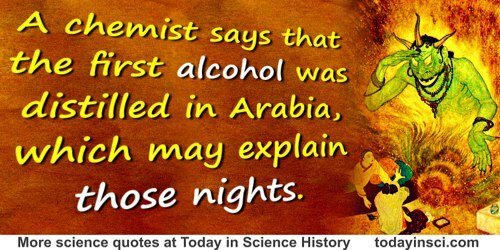 It includes alcohol, because the latter is burned to yield energy, though it does not build tissue. It excludes creatin, creatininin, and other so-called nitrogeneous extractives of meat, and likewise thein or caffein of tea and coffee, because they neither build tissue nor yield energy, although they may, at times, be useful aids to nutrition. Methods and Results of Investigations on the Chemistry and Economy of Food, Bulletin 21, US Department of Agriculture (1895). Quoted in Ira Wolinsky, Nutrition in Exercise and Sport (1998), 36. 'The Delayed Exit of Claude and Eustace', The Inimitable Jeeves (2011), 193.